Yesterday was a little bit scary for me but very exciting for Max and Lucia. It was the day we took Max’s stabilisers off his bike and the day we took Lucia out for the first time on her brand new birthday bike. Thankfully we all survived! When my sister asked us about buying Lucia a bike for her birthday my initial reaction was ‘no way!’ as I imagined her falling off, cutting her legs, bleeding and crying, possible infection and compression garments in tatters. A wee bit dramatic I know, but the very thought of her on a bike brought me out in a cold sweat (and still does) even though we have the first outing over. However, this is something I have to really try and get over, but I am finding that much easier said than done. I still can’t even bear Lucia running (unless on grass) in case she trips and falls and hurts her legs never mind being let loose on a bike. I feel like I am constantly telling her to stop running and naturally she doesn’t understand why. When she takes off after Max I go into instant panic and see obstacles everywhere – uneven pavement, a slight slope, stony ground – and chase after her like a maniac telling her to stop and grabbing hold of her hand. At these moments, as well as feeling like a totally neurotic mum, I do actually feel like my heart is going to jump out of my chest. At the same time though I feel awful for making her slow down because it isn’t fair. She is just being a normal toddler and I am holding her back. So when the bike issue came up I had my panic but agreed with Daryn when he said why not? We have to let her do the things that any other three year old does – but we just have to do these things slightly differently and in our own way to try and limit, as much as possible, falls, scrapes, cuts, bruises etc. Obviously a helmet is a necessity but I also insisted on knee pads and asked whether it would have been OTT to get her shin guards and padded trousers stuffed with cotton wool – you can guess the answer to that! So my compromise is her compression garments, leggings on top plus knee pads for extra protection. However, I am still thinking about looking up some kind of padded trouser for when she starts learning on two wheels. And so off we went in the Spring sunshine to have a go – and the delight on Lucia’s face was gorgeous. She absolutely loved being on her new bike and shouting ‘wheeeeeee’ as we pushed her along. And this was the secret of our success yesterday – she hasn’t quite got the hang of pedalling yet so she can’t take off on her own. Therefore I am in control! There is no speeding off and wobbling on her stabilisers, no over balancing, no hitting a rogue stone and falling off…and when we push her along the pedals don’t turn themselves so no danger of them whacking her on the shins. Also, because this was Max’s first time on two wheels we spent a lot of time on the grassy area hanging onto his bike and running alongside him as he wobbled about trying to find his balance – and at these times we let Lucia off her bike to have play on the lovely soft grass! Max had a great first practice day and we are really proud of him! I know this might all sound completely crazy but to be honest I thought all the same things about Max on a bike in the beginning! However, for a child with Lymphoedema we really have to consider this side of things because something as simple as a cut or graze always has the potential to turn into something more complicated. As you know I am always extremely positive about everything but falling and injuries always make me totally freak out. Looking back to when Max was younger I do remember being like this with him too, but probably not to the same extent. It didn’t help that anytime he fell and cut himself it was major trauma! If he cut his knee he limped for three days or if he scraped his elbow he lost the use of his whole arm for a while! So that probably hasn’t helped my nerves! However, what I need to remember is that Lucia has had some cuts and scrapes before – some pretty bad ones too and so far they have never caused her any problems. She recently had quite a nasty infection in her big toe but after a week of us applying savlon and keeping a close eye on it, it sorted itself out. It can be a tough balancing act at times to let Lucia do what she wants to do while trying to protect her – but crucially not over protect her – so that she can get on with doing what toddlers do. The same goes for Max as he reaches an age where he wants to play outside with his friends and doesn’t want me hovering around him and cramping his style! So I am just trying, like any other parent, to learn how to apply this balance. And to be honest I will probably be learning forever. You are so sweet Tula and you are right. She will be fine, I on the other hand may not lol! Jo-Ann as usual I love to read your blog as it reassures me I am not alone. I also seem to shout “be careful” “not too fast” “watch where your going” I know I need to let her be a kid, but it terrifies me too. We put her little trampoline outside yesterday she has been happily bouncing away and was sound asleep by 8pm. Her feet and legs are as soft as can be. I’m so glad to see I’m not the only one to shout slow down you’ll fall. 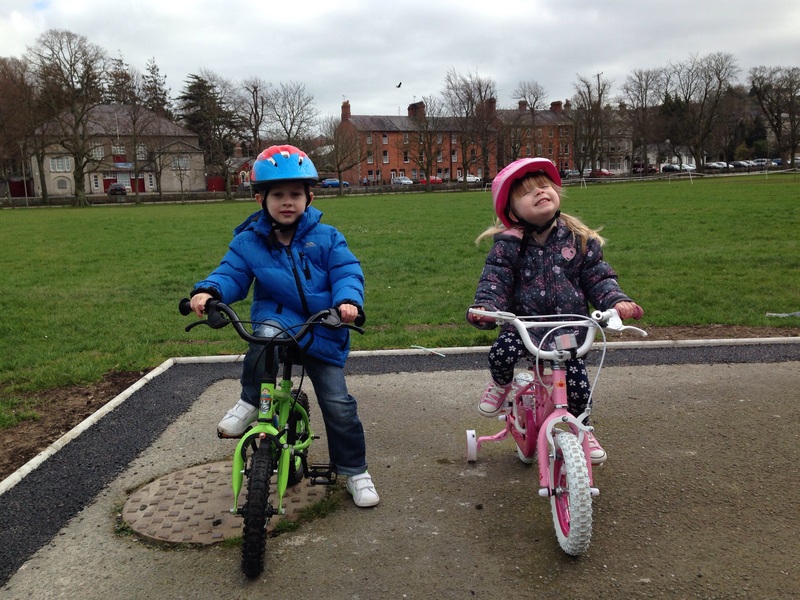 I try as much as possible to let Aoibhe do normal kids stuff but we haven’t yet been down the bike route. At present her upcoming school tour is causing stress for me. The joys of living with lymphoedema! Definitely not alone Donna…think we are all the same. Hope the school tour goes ok – I’m sure she’ll love it (while you stress in the background! ).